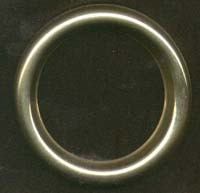 3" brass aroma ring designed to disperse fragrance using heat from a regular light bulb. Usually $1.89 each. Just simply put in a few drops or more of your favorite oil, place ring on top of your light bulb and your fragrance will warm. Purchase a 6 pack for $4.99, just .83 cents each!